Dr. Fleischer has been in practice in the Chicago area and actively involved in the training of podiatric surgical residents since 2004. In addition to his clinic practice, Dr. Fleischer also serves as Chairman of several committees at Rosalind Franklin University, including the Institutional Review Board, Scholl College Academic Assembly, and Scholl College Swanson Independent Scholar Committee. 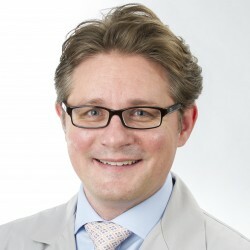 His publications, teaching and research interests focus on musculoskeletal imaging (specifically MRI and ultrasound), evidenced-based medicine, diabetic foot care/limb preservation and surgical outcomes. Dr. Fleischer welcomes new patients of all ages. His clinical interests include all aspects of elective and non-elective foot and ankle surgery.